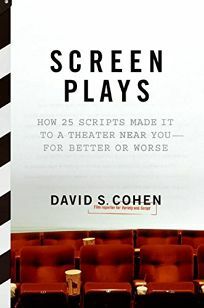 As a well-placed observer who knows intimately many of tinsel town's key players, Variety reporter and 25-year Hollywood insider Cohen reveals the story behind 25 scripts that became such high-profile projects as Lost in Translation, Troy, American Beauty and The Aviator. On the way, budding screen-writers convinced their own story seems like a long-shot will find inspiration (or at least comfort) in stories like Milo Addica and Will Rokos's, whose screenplay for Monster's Ball was rejected by top industry brass as ""the best script that will never get made."" With the deep background reporting he's known for, Cohen produces revealing nuggets of moviemaking trivia, alongside stories of serendipity and triumph; for instance, had Erin Brockovich not shared a chiropractor with her future producer, Carla Santos Shamberg, her movie probably would never have been made. Nowhere is Cohen's understanding of the tempestuous film industry more apparent than in the compelling account of Black Hawk Down screenwriter Ken Nolan, who was terminated from that project only to get himself re-hired and, ultimately, sole writing credit. Cohen's is a surefire crowd-pleaser for casual movie fans and true cineastes.